Sitting here on my 18 hour flight, somewhere over the North Pole - thanks to a wonderful 3.5 hour delay in shanghai - I can't but help think about my lasts. The last week has been a whirlwind of them. Or at least what I convince myself are lasts. The end of this road is near. And by near I mean less than 24 hours near. Somewhere between bowls of noodles, rambling on about American holidays to my poor students or drinking baijiu a year has slipped by. Certainly not the slipped in the sense of slipped though my fingers - I think, all backpatting and self-congratulating aside, I have integrated/pushed my way into this community pretty well - but more of a whoa-whoooaaaa-WHOOAAA where-the-hell-did-that-year-just-go kind of slipped by. This isn't being written dry-eyed. Living here in China going on 11 months my perceptions about certain things have definitely changed. I no longer spit out little bits of gristle and fat - sometimes I even go out of my way to order it on kabobs - when eating meat. I have convinced myself that drinking milk out of a small plastic bag is the norm. That would be quite the punchline - instead it was my day. steep. Kudos to the taxi/rally car driver that got us there and back. The visit was initiated after an argument about apricots. Thats right, apricots. I walked into my second office a bit late today. Only a few minutes to class and I was busy gathering a few of my things before I was off to teach the little horrors angels in class 14. "Allister your beard is mightily long today." After only two days without a shave I wouldn't go so far as to call it a beard. Certainly not one worthy of "mightily." "Sorry Feng Laoshi, I was a bit lazy this morning." For the students - especially the Senior 3 students - that means big trouble. Tests. 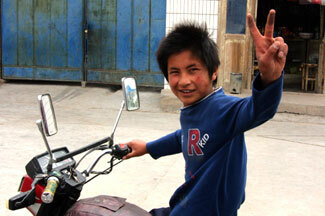 Here in China students are being prepped for the college entrance exam years in advance. And today is T-Day. Three days actually of grueling tests that dictate the rest of each students life. The test - known as the Gao Kao - is the single qualification for entering a college or university. Score well? You can hope to go to Beijing or Shanghai to one of the nationally recognized universities. Score poorly? Go to a local college and expect to work in a menial job for years to come. It's that bad. So what do I do to prepare myself for this? Tell-tale signs you should skip reading a post? It starts off with a cliché of this magnitude. A cliché that I am probably too young to fully appreciate. But, as usual, I am throwing caution to the wind. This case might just be appropriate enough. When friends found out I was spending my May holiday in Xinjiang they always asked if I was going to visit the splendid Tian Shan Mountians. 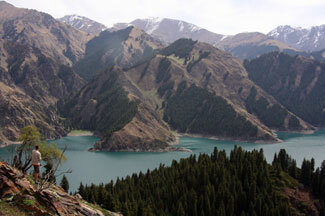 Tian Shan is well cemented in the minds here as a place of excelling beauty and no small amount of mysticism. Tian Shan is generally translated as the Heavenly or Celestial Mountains - tracing from the local Uyghur name Tangri Tagh. The mountains are north-west of Urumqi and extend 2,800km from the south in Tajikistani where it meets the Pamir Mountains and along the north edge of the Taklamakan Desert skirting Xinjiang, Kazakhstan Pakistan and Kyrgyzstan. 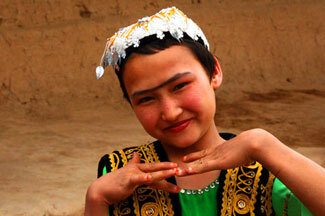 A source of pride in Xinjiang for the majestic peaks and a particularly beautiful area name Tian Chi. After a early AM bike ride out to the ancient city of Jiaohe we felt pretty accomplished - getting out of paying some absurd tourist ticket price, trespassing and finding a beautiful oasis. Not bad for returning the bikes and being back at the hotel by 9:30AM. The previous day we had met a couple living in Beijing - an expat running a small travel rag and his girlfriend, a documentary producer - walking out to Su Gong Ta. Hoping to economize a bit we agreed to meet and rent a taxi for the day to drive us out to the local Grape Valley and Flaming Mountains. We stocked up on drinks to keep the heavy sun at bay, a few snacks for the road and set of in our rickety red taxi into the rising Turpan sun.